Comic Coverage: Spider-Man Meets...Burgess Meredith? Courtesy of the awesome Frederator site, someone spotted a pretty amazing cameo on an old episode of Naked City. No, it's not what you're thinking (perverts). Naked City was a popular police drama of the late 50's and early 60's (sort of the Hill Street Blues of its day). 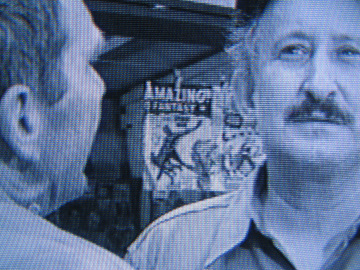 That's not only a Spider-Man comic book displayed behind the actors, but the very first appearance of Spider-Man in Amazing Fantasy #15 (1962), hanging there as casually as any other comic book on the stand. But wait....there's more!. Take another look at the shot of the two actors, then look just to the right of Amazing Fantasy #15. 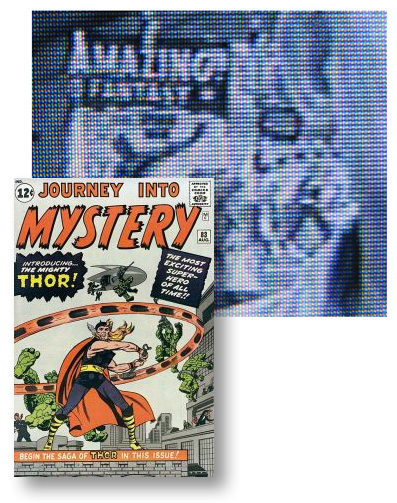 Sharp-eyed fans of Silver Age Marvel Comics will recognize the cover to Journey Into Mystery #83, featuring the first appearance of The Mighty Thor! I'm sure none of the cast and crew of Naked City would have ever guessed a 24¢ purchase of both titles would net them well over $100,000 in today's collector's market. 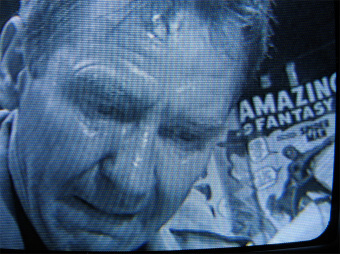 Maybe that's why Burgess Meredith was sweating so profusely. He somehow knew he was in the presence of comic book history! Click here for the original Frederator post. Now THAT is really cool! Thanks! Just found your blog, enjoyed your best/worst covers..good work! Thanks! Glad you liked the posts!